Warm up activities for the primary classroom provide useful, stimulating ways to start your class. As a primary school teacher, you may have difficulty getting your students' attention at certain times during the day, such as in the morning, after lunch or recess, and toward the end of the school day. Implement warm up activities to get your students ready to focus on the following lesson. The marching game provides a useful way for your students to warm up through movement while helping them maintain focus and prepare for the lesson ahead. In this simple activity, ask your students to march in place while reciting the alphabet. Ask students to count by multiples of 2, 5 or 10 if the following lesson teaches math skills. This activity helps children get rid of excess energy, which works well when students have trouble settling down. Ask your students to walk calmly around the room. Call out a specific command telling students to perform a certain action. For example, shout out, "jumping bean." Your students should jump up and down. Use the "frozen bean" command to instruct your students to stand as still as possible, or "runner bean," which asks them to run in place. Use your own ideas to add interesting and creative variations to this game. Play sheep tag for a simple and engaging way to stimulate your students. Ask most of the children to pretend to be sheep. Choose a few students to act as farmers, and other students to serve as the chasers. The chasers try to tag the sheep. The tagged students must lie on their backs with their legs in the air, making a "baa" sound. They can only return to a standing position once a farmer rolls them over. Play the game more than once so students get the chance to play different roles. This warm up activity helps students develop basic coordination skills. It also grabs their attention and focus. Stand in front of the room. 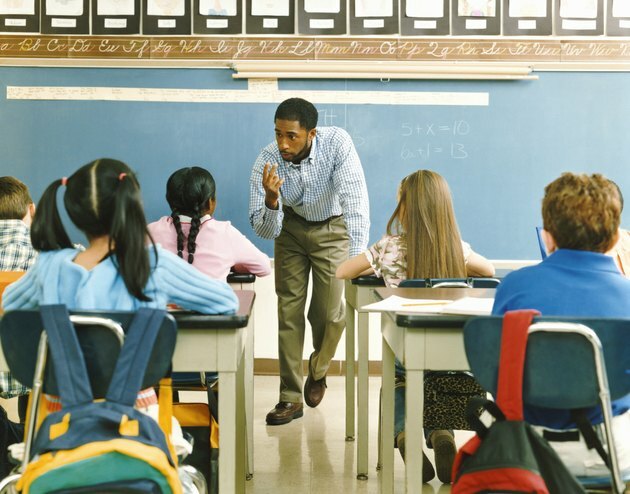 Ask your students to copy your actions, but only if the action is preceded by the words "Simon says." If you haven't said "Simon says," and students perform the action, they must sit in their chairs for two turns before they can participate again.